We even have a club icon! Artists – The club members of the BWFC. Artistic Ranks – How the club member ranks work for BWFC. 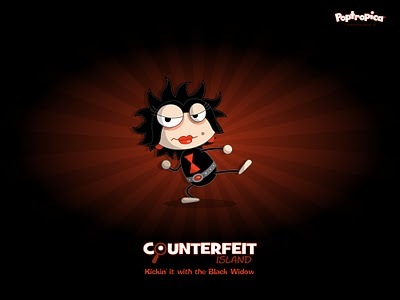 Black Widow’s Artwork – Official Poptropica artwork that relates to Black Widow. 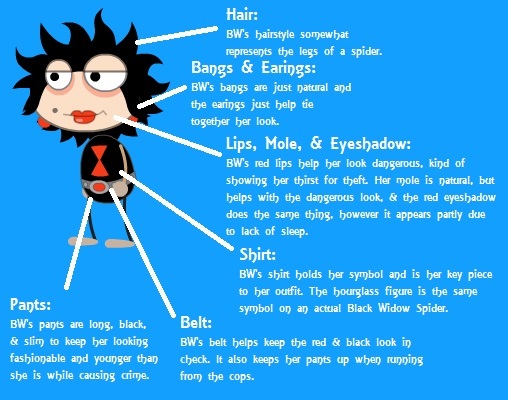 Spider Safety – Facts, trivia, an outfit description, and general info about Black Widow. 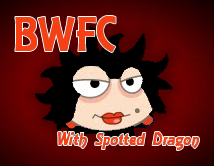 Here are all the club members of BWFC! They are listed in rank, then alphabetically. Here is how all the BWFC ranks work (what they do) and how many people each rank can have. They are listed by how high the rank is. Vice President – Show contribution to the BWFC, beat Counterfeit and Super Villain Island at least once (The more the better), and do not ask for the rank. The President picks a certain person. 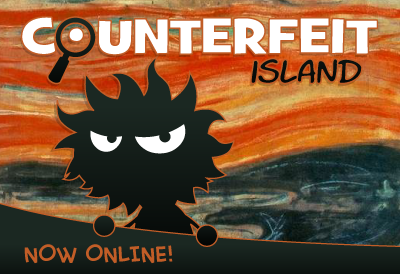 Master Thief – Complete Counterfeit Island 5 times, complete Super Villain Island 2 times, and say anything that will possibly help you win the rank. The President will decide if you qualify. Thief – Complete Counterfeit Island 4 times, complete Super Villain Island 1 time, and say anything that will possibly help you win the rank. The President will decide if you qualify. Guard – Complete Counterfeit Island 3 times, complete Super Villain Island 1 time, and say anything that will possibly help you win the rank. The President will decide if you qualify. 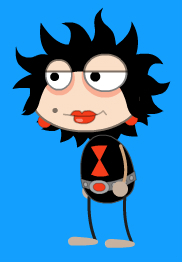 Here is all the official Poptropica artwork that relates to Black Widow. This doesn’t include fan art or art that she has stolen. Everything is listed alphabetically. 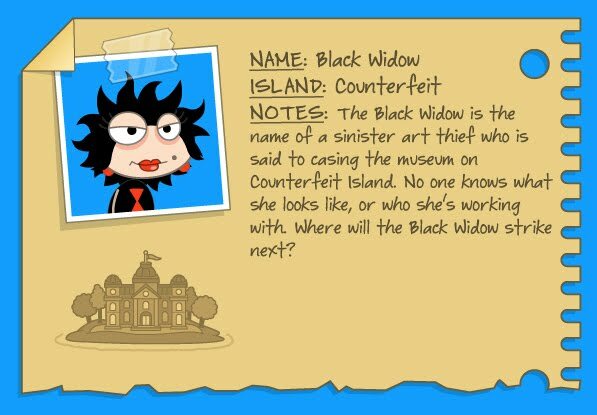 The Black Widow/Black Widow/BW is the main villain on Counterfeit Island. 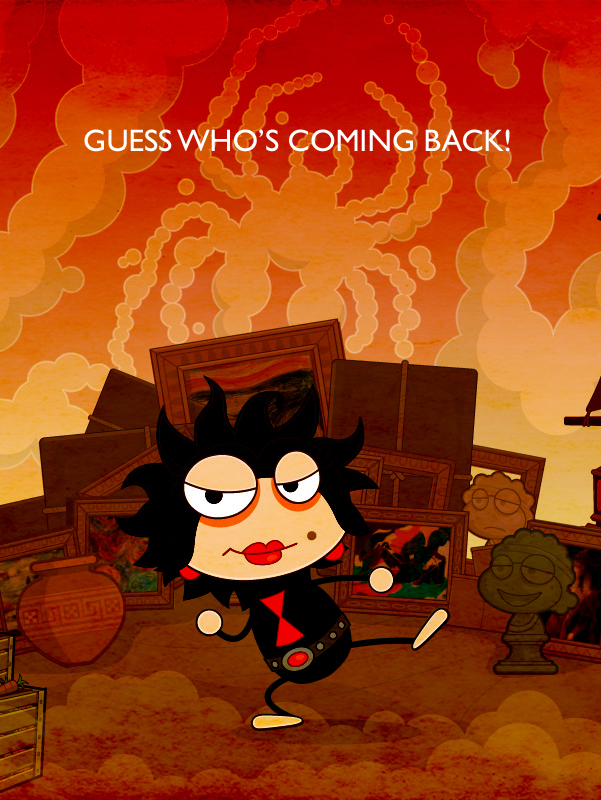 She is one of the best known villains and a Poptropica Creator! Her real name is Jennifer Wood, she is a Managing Editor with Poptropica, she lives in the United States, and her username is BlackWidowCreator. Black Widow is the main villain on Counterfeit Island, but reappears as a contestant on Reality TV Island, and as a villain on Super Villain Island. Black Widow is also (lesser) known as… the White Widow, the Sand Spider, the Twilight Tarantula, Creepy Crawly Canvas Criminal, the Evil Eight-Legger, the Art Appropriating Arachnid, and the Thief With a Thousand Names. On Counterfeit Island Black Widow is disguised as The Inspector throughout the beginning of the quest. At The Inspector’s (BW) cabin on Counterfeit Island, there is a sign that says Black Widow in French. It says Veuvre Niore, however “Noire” is misspelled. Black Widow is the 2nd villain to pose as a good guy in the beginning of an island. After Director D. (Spy Island) and before Zeus (Super Villain Island). The Black Widow, like all the other villains, has a unique outfit that shows her personality. More Club Stuff Coming Soon! Black Widow is my favorite villain! Can I join? I added you (SD is a bit busy right now)! I will complete the islands a few Times but super villain is really hard! Awesome! You have been added! Hi. I would like to earn the rank of master thief. I have completed Counterfeit Island more than five times, and Super Villain Island once (on my various accounts). 1. On Counterfeit Island, she was really clever and dressed up as the chief inspector of police. 2. On super villain island, she and her army of mini spiders are FIERCE. Sadly, since you’ve only completed Super Villain Island once, you did not earn the Master Thief ranking. Hey, can I join? I finished Super Villain Island 5 times and Counterfeit Island 4 times. Black Widow is my 1st favorite villain because she shows herself in the beginning and fools everyone! Even her partner, which is so smart. I also like how she is the only villain that holds things for ransom. It’s cool that actual art is talked about on Counterfeit Island, and on Super Villain Island, I like how she is the only Villain that really puts up a fight. Dr. Hare wants you to help him, Crawfish just sleeps, and Mordred uses the clock to fight instead of actually being a Villain and fighting himself. BINARY BARD IS SUPERIOR! AND SO IS BLACK FLAGS! Widow rules the bard is just half computer. We all have computers near us, so he isn’t unique. And BTW, Black flags is a pirate ship so it’s Crawfish’s. Can I be apart of the fan club? Throughout my various accounts, I have completed Counterfit about 5 times and Super Villain 2. 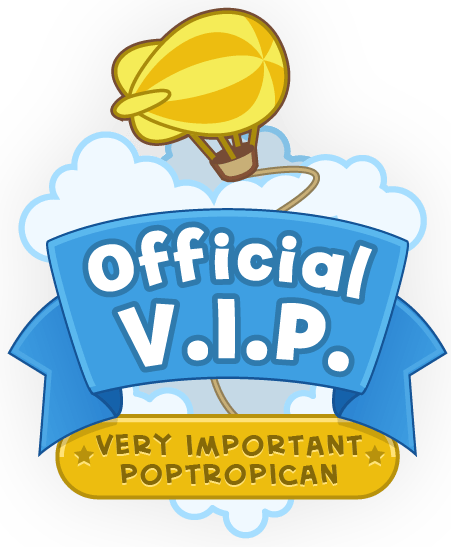 The Black Widow minigame (where you have to save the stolen art) is my favorite minigame of Poptropica so far, and I love how she disguises herself as the chief investigator. I also like how you have to go into the paintings to erase the words in SV. She is my third villain after Gretchen and Zeus. Hey, SD, I’m making a BW fan club on Nameless’s new blog and I was wondering if I could use the ones you have here? Completed counterfeit 2 times.I’m ready to complete it a 3rd time. I’m ready to be upgraded to guard!Proof:my user is Dude38764. I also completed super villian island once. Black Widow is DEFINITELY my favorite villain! Why? Well, an art thief sounds just SO EPIC!!! Plus, I’ve been to France, and I love artwork. 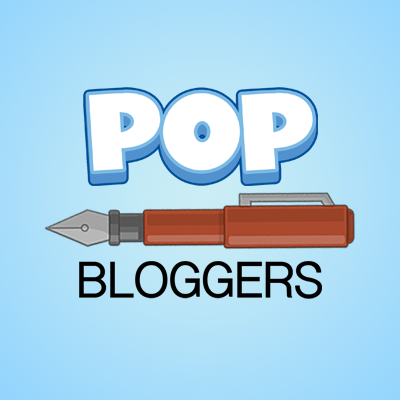 A Poptropican thief who steals artwork from French museums? Definitely awesome. I also like her because she is sneaky and stealthy. 😯 I go out of town for a day and a half and I miss THIS? Looks like I’ve got a new biggest fan of my own! And just in case people don’t have any idea what you’re talking about, you can put a note saying, “the one with the owl gravatar” or something. However, I don’t watch Adventure Time. SD: umm… I’ll add the fact that I don’t watch Adventure Time to my list of crimes against humanity. Hello,Spotted Dragon! How are you today?Wait,who am I talking to? I actually thought she was a good guy! and can you update my name? How do you get a higher rank than member. Can i join?She’s my second favorite villian.I’ve commpleted 18 islands.I like black widow because her name is the name of a very dangerous spider the black widow(it makes her sound dangerous). I just want to be a member. I’ve completed all the islands. Black Widow is tied with Gretchen Grimlock for my favourite villain, with Binary Bard in second. Black Widow is the second villain to appear as a good guy, after Director D and before Zeus (in Super Villain). Black Widow was third in the Poptropica Villain showdown, after Captain Crawfish (2nd) and Binary Bard (1st). My blog is talltalesandnerdparadise.wordpress.com . I have completed 33 islands. Err DUH im obviously going to go join the binary bard club. I LOVE binary bard. His da best! Nuuuuuuuuuu!!!!!!!!!! FF join Dr. Hare! Can I be he Vice President? May I join this club as well?